Tonight we interview the host of Mindstream Radio and the producer of an independent film on dating and relationships in the Black communitty entitled "I'm Single Because: The Civil War Between Black Men and Women." The rate of marriage is at an all time low in the African American community; and is the lowest among all other racial groups in the United States. Upon doing research, we came across a trending topic on twitter with persons of color, ages ranging from 25-45 years, stating why they are single and unmarried. In 2001, according to data collected by the U.S Census: African Americans are the most uncoupled ethnicity at 43.3 percent for black men, and 41.9 percent for black women in contrast to 27.4 percent and 20.7 percent for whites respectively. In a 2006 Washington Post article written by Washington writer, Joy Jones, Marriage Is For White People. It’s been her observation that women are being hit the hardest, and that marriage may not be as possible or sustainable as she would like. Since marriage isn’t a possibility, black women turn to negated effects like having babies out of wedlock, birth control, divorce and remarriage which has completely transformed the social landscape. In our conclusion, we believe a cultural war is being waged against the institution of marriage in the African American community. We decided to do an in depth documentary film on why peoples of color are single. 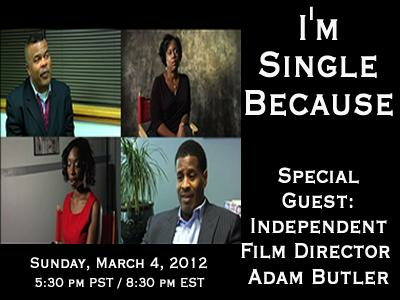 Join us tonight as we discuss the issue of singleness in the Black community with producer/director Adam Butler. Call 347-327-9215 to share your thoughts!